The Brembo Big Brake Kit for Hyundai Genesis provides the best braking performance and handling for the street or track. 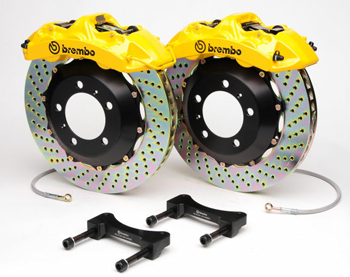 Get the ultimate brake system upgrade for the Infiniti G35 and Nissan 350Z with the Brembo Big Brake Kit. 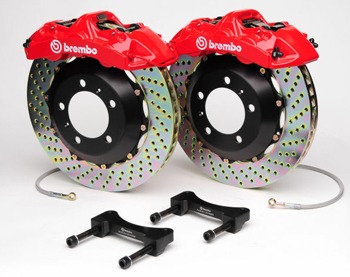 With the Brembo Big Brake Kit, you are replacing the smaller factory caliper and brake rotors with much larger multi-piston brake calipers and drilled or slotted brake rotors. Upgrading to a larger braking system will dramatically improve braking distances and consistency for better braking during spirited driving or track day events. 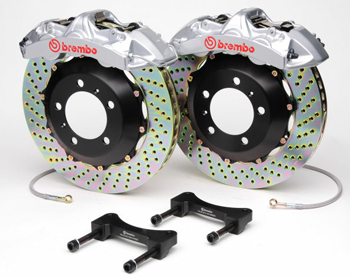 The Brembo Big Brake Kit for G35/350Z is available with drilled or slotted brake rotors that dissipate heat significantly better than factory brakes, and are designed to eliminated brake dust and gases. The included brake rotors were designed to greatly improve cooling capacity and increase resistance to cracking by over 40%. 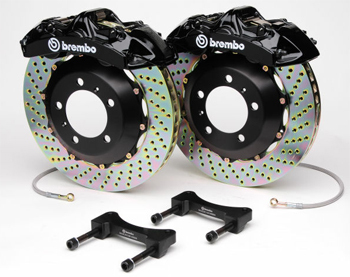 The Brembo Big Brake Kit is available in 4 different caliper finishes so you can show off your new big brake kit on the G35 or 350Z. So not only will you have the best performing big brake kit available, you'll also have the best looking as well.